Finding the origin of Hawking radiation has been a puzzle to researchers. Using a loop quantum gravity description of a black hole slice, a density matrix is defined using coherent states for space-times with apparent horizons. Evolving the density matrix using a semi-classical Hamiltonian in the frame of an observer outside the horizon gives the origin of Hawking radiation. A new theory is expected to take over at Planck distances as “quantum effects” of gravity start dominating. One of the promising approaches to the theory of quantum gravity is the theory of Loop Quantum Gravity (LQG), which is by formulation non-perturbative and background independent [1-3]. LQG has a well defined kinematical Hilbert space, and though the Hamiltonian constraint remains unsolved, the theory allows for a semiclassical sector of the theory. This includes “coherent states” [4,5] which are peaked at classical phase space elements. Using these as a starting point, I defined in a series of papers [6-8] coherent states for the Schwarzschild spacetime, and derived an origin of entropy using quantum mechanical definition of entropy from density matrices. The exact entropy is a function of the graph used to obtain the LQG phase space variables . The zeroeth order term is proportional to the area of the horizon signifying a universality of the Bekenstein-Hawking entropy. The proportionality constant and the correction terms bring out the details of the graph . In this paper we take this new way of finding the origin of entropy a step further by evolving the spatial slice in time , and observing the evolution of the density matrix in the process. This state as of now does not satisfy the Hamiltonian constraint, but one is allowed to take an arbitrary initial state, or a wavepacket with appropriate properties, representing a macroscopic configuration. The evolution discussed in this paper is semiclassical, i.e. no attempt is made to use the full Hamiltonian. The quasilocal energy (QLE) of an outside observer, defined in  is used as the Hamiltonian to evolve the system. As the time clicks in the observers clock, the Hamiltonian evolves the coherent state such that the area of the horizon remains the same as predicted by classical physics. However, classically forbidden regions become accessible quantum mechanically, and vertices of the graph hidden behind the horizon in one slice emerge outside the horizon in the next slice. This gives a net change in area, and the mass deficit is emitted from the black hole. This evolution is not unitary, and the quasi-local energy which is used to evolve the slice is not mapped to a Hermitian operator. When matter is coupled to the gravitational system, a net flux emerges causing a decay of the horizon. In Section 2 we introduce the formalism by describing the coherent state, the black hole time slice, the apparent horizon equation, and the density matrix. Section 3 describes the time evolution of the system and gives a derivation of the change in entropy. In Section 4 we give a description of a matter current emergent from behind the horizon. Finally in the concluding section we include a discussion about the implications of the nonHermitian evolution. For gravity, finding the canonical variables which describe the physical phase space is an odd task as there is no unique time. Nevertheless a fiducial time coordinate can be chosen, which breaks the manifest diffeomorphism invariance, restored in the Hilbert space of states by imposing constraints. where represents the internal index for the rotation group SO(3) of the tangent space and . The internal group is taken to be SU(2), as this is locally isomorphic to SO(3). The theory is then defined in terms of the “spin connection” and the triads. However, a redefinition of the variables in terms of tangent space densitised triads and a corresponding gauge connection where I represents the SU(2) index simplifies the quantisation considerably. In  the was evaluated for the Schwarzschild black hole by embedding a graph on a spatial slice with zero intrinsic curvature. The particular graph which was used had the edges along the coordinate lines of a sphere. This simplistic graph, was very useful in obtaining the description of the space-time in terms of discretised holonomy and momenta. A particularly interesting consequence of this was that the phase space variables were finite and well defined even at the singularity. Thus we are considering a semiclassical state, which is a state such that expectation values of operators are closest to their classical values. The information of the classical phase space variables are encoded in the complexified SU(2) elements labeled as . The fluctuations over the classical values are controlled by the semiclassical parameter t.
where is the coherent state wavefunction for the entire slice, a tensor product of coherent state for each edge. (N is a constant, a function of the edge lengths and the area bits of the discretisation) and V is the volume operator. The regularisation (13) is thus an allowed approximation. As a result of this if we impose restrictions on the Christoffel connections and one of the vertices is within the horizon, whereas is outside the horizon, there will be correlations across the horizon. where covers a band of vertices surrounding the horizon one set on a sphere at radius and one set on a sphere at radius within the horizon, as described in , and in the figure enclosed. This local density matrix and the correlations due to the apparent horizon equation (19) was used to derive entropy . This entropy counts the number of ways to induce the horizon area using the spin networks, though the constraints have not been appropriately imposed as was obtained using a Chern-Simons theory in . However, the entropy calculation using the coherent states provides a tracing mechanism, and a method to obtain correlations across the horizon which are gravitational in origin. We will henceforth deal with , but we will drop the local label for brevity. In physical systems, the Hamiltonian generates time evolution, but in General Theory of Relativity, the Hamiltonian is a constraint and generates diffeomorphisms in the time direction. So the question is, what is physical time, and if that exists, what would be the operator evolving the system in that direction? In case of space-times with time like Killing vectors, notion of time can be identified with the Killing direction, and a notion of “quasilocal energy” (QLE) defined using the same. The QLE then generates translations in the Killing time. In case of the Schwarzschild space-time, the QLE has been defined in . We build the Hamiltonian which evolves the horizon from one time slice to the next by appropriately regularising the QLE. Note the “Killing time” and QLE are classical concepts, and thus regularising QLE gives us a “semiclassical” Hamiltonian. This is clearly calculable, and gives the change in entropy . The term yields corrections, and we ignore it in the first approximation. To trace the origin of Horizon fluctuations, we must take an observer who is stationed outside the horizon, or in other words is not a freely falling observer. The quasilocal energy is defined using a “surface” integral of the extrinsic curvature with which the surface is embedded in three space. In our case, we take the bounding surface to be the horizon and the quasilocal energy is given by the surface term [11,15]. where is the extrinsic curvature with which the 2- surface, which in this case is the horizon is embedded in the spatial 3-slices, and is the determinant of the two metric defined on the 2-surface. This “quasilocal energy” is measured with reference to a background metric. Thus . We concentrate on the physics observed in an observer stationed at a r = constant sphere. as this arises due to the coordinate transformation and the norm of the vector in the previous frame. In the rewriting of (37) in regularised LQG variables the Hamiltonian appears rather complicated. 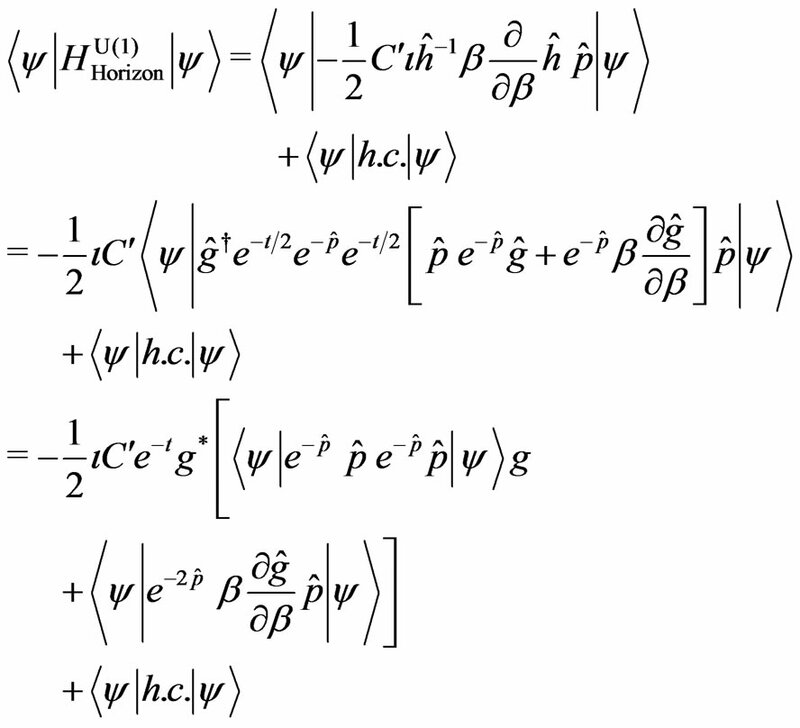 where we have used the classical apparent horizon equation (10) (with ). where consists of some dimensionless constants is the 2-dimensional area bit over which is smeared, is a dimensionfull constant which appears to get the dimension less. 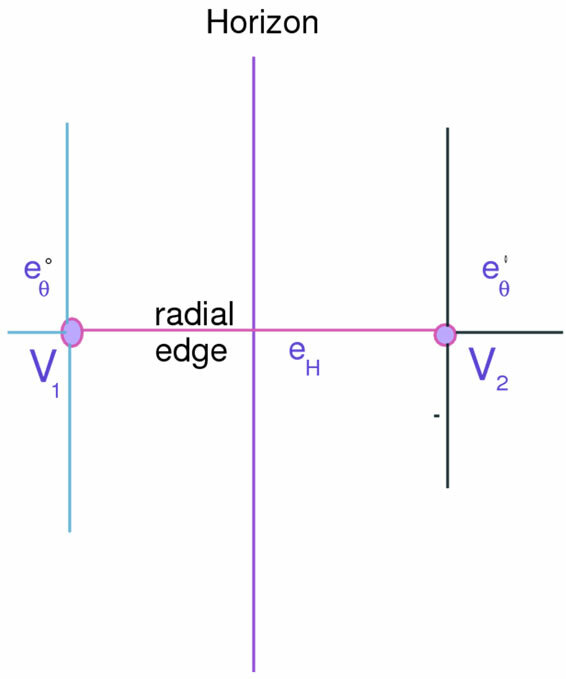 is the length for the angular edge over which the gauge connection is integrated to obtain the holonomy. The sum over is the set of vertices immediately outside the horizon. The (39) can then be lifted to an operator. This regularised expression for QLE is for the horizon 2-surface only and would not apply for any other spherical surface in the Schwarzschild space-time. is the complexified phase space element in the “n-th” representation. The prefactors have been clubbed into . In the calculation of the matrix elements, we drop the label of the edges for the Hamiltonian. This calculation can be done by putting an assumption that the . In this are completely independent of . It is an allowed assumption, and identifies the dependence of the operator matrix elements, which are otherwise “hidden”. The calculation however introduces an arbitrariness in the formula, which can be fixed by requiring that the expectation value of the Hamiltonian agrees with the classical QLE . However, in this paper we use the “annihilation” operators defined in . this is actually the classical QLE as it should be from . This is obvious, as the way the Hamiltonian is defined, this is simply a function of the Hilbert space outside the horizon, and the matrix elements of this will not yield anything new. We approximated the horizon sphere by summing over vertices immediately outside the horizon. We could do the same by summing over vertices immediately within the horizon. For the Lemaitre slice, the metric is smooth at the horizon, and one can take the “quantum operators” evaluated at the vertex . In this case however, as the region is within the classical horizon, the norm of the Killing vector is negative, and has components which are imaginary. The . we extracted the from to get and rewrote the rest of the constants as . Thus there is a net change in entropy, but, to see if this is Hawking radiation, we have to couple matter to the system. where the area element at vertex on the sphere. This change in entropy is totally gravitational in origin, and seems to signify the emergence of “geometry” from within the horizon. In fact, if we some over the area, we get the (if we set ), which would be the change in entropy when the radius of the horizon changes by ! The first term is remarkable, it shows that the term giving rise to entropy change teams up with the expectation value of the scalar Hamiltonian. The second term yields corrections, so we ignore it in the first approximation. The exact details of the computation have to be obtained using the coherent state of the matter and gravity coupled system [17,18]. If one simple takes the matter + gravity system in a tensor product form, and one has matter quanta of energy sitting at one vertex, then the first term would give new matter in the evolved slice as . The “rate” of particle creation thus has the form where is the Hawking temperature for the signs and negative (positive) . Thus from the above it seems 1) One has found emission of matter quanta from a black hole but from a “semiclassical” description rooted in a theory of quantum gravity, beyond quantum fields in curved space-time. 2) The results indicate a non-unitary evolution which allows space to emerge from within the horizon. 3) The emission is perceived by a static or an accelerating observer as anticipated, and the non-unitary flow might be due to the semiclassical approximations. A quantum evolution using the quantum Hamiltonian might still be unitary. 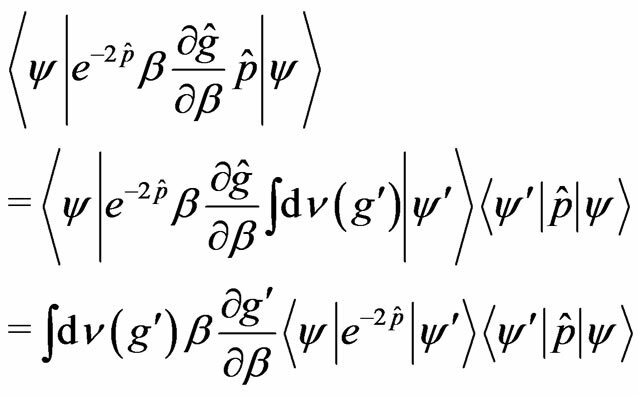 The above derivation seems to be a “quantum gravity” description of the tunneling mechanism for describing Hawking radiation . However, the results are preliminary and further investigation has to be done. In this paper we showed a method to obtain the origin of Hawking radiation using a coherent state description of a black hole space-time. We took a quantum wavefunction defined on an initial slice, peaked with maximum probability at classical phase space-variables. We then evolved the slice using a Hamiltonian, which is the “quasilocal energy” at the horizon. This QLE evolved the system in the time and the entropy was shown to change, indicating a change in black hole mass and hence an emergence of interesting non-unitary dynamics. One of course has to investigate further to see what is the endpoint of this time evolution. The time flow indicates one might have to formulate quantum theory of gravity rooted in irreversible physics. The presence of additional degrees of freedom in the form of “graphs” also indicates that the classical phase space might not be described by deterministic physics, but by distributions, a manifestation of microscopic irreversible physics in complex systems. This research is supported by NSERC; research funds of University of Lethbridge. I would like to thank B. Dittrich for useful discussion; J. Supina for proofreading the manuscript. A. Ashtekar, “New Perspectives in Canonical Gravity,” Bibliopolis, Napoli, 1988. A. Dasgupta, “Coherent States for Black Holes,” Journal of Cosmology and Astroparticle Physics, Vol. 3, No. 8, 2004, pp. 1-36. A. Dasgupta, “Semiclassical Horizons,” Canadian Journal of Physics, Vol. 86, No. 4, 2008, pp. 659-662. A. Dasgupta, “Entropic Origin of Hawking Radiation,” Proceedings of 12th Marcel Grossman Meeting, Paris, July 2009. B. Bahr and T. Thiemann, “Gauge-Invariant Coherent States for Loop Quantum Gravity. II. Non-Abelian Gauge Groups,” Classical and Quantum Gravity, Vol. 26, No. 4, 2009, Article ID: 045012.